The chairman of the Republican Party of Iowa is calling on the state’s top Democrats to stop a bill advancing at the statehouse which would change the way Iowa’s Electoral College votes are cast. In each presidential election, Iowa’s Electoral College votes are cast for the candidate who carries the state. A bill pending in the Iowa Senate calls for a change, so Iowa’s seven Electoral College votes would be cast for the candidate who wins the popular vote nationally. Iowa Republican Party chairman Matt Strawn is asking Democrats to take the bill off their to-do list. "This popular vote scheme is just another in the long list of, quite frankly, things that aren’t going to improve the lives of Iowans," Strawn says. Iowa has been a battleground state in the past three presidential elections, with candidates spending time and resources here to win the state’s seven Electoral Votes. If Electoral College votes are cast based on who wins the most votes nationally, Strawn argues presidential candidates will bypass Iowa and campaign in bigger states where they can reap more votes. Strawn is urging party activists to lobby legislators on the bill. 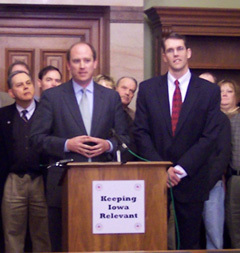 "Let their legislators know, both Republicans and Democrats, that it is time to keep Iowa relevant in presidential politics," Strawn says. As you may recall, Al Gore won the popular vote nationwide back in the 2000 election, but George W. Bush won enough states to win the Electoral College vote and Bush became the 43rd president. In past weeks, some Democrats in the legislature have argued the Electoral College system should be changed to ensure whomever wins the most votes wins the presidency. Read The Blog for an update on this story. Governor Chet Culver and Secretary of State Michael Mauro — both Democrats — say the bill Democrats in the legislature are pushing is a bad idea.